A few weeks ago, we contributed an article to AdExchanger’s Data-Driven Thinking column about the civil war within the advertising industry. In the article, we discussed that the industry factions could be in trouble — with the exception of Google. We wanted to expand on why and how Google became such a powerful player in the online advertising industry. Depending on the day, Google (Alphabet) is the world’s most valuable company. They aren’t considered valuable just because of Gmail, Maps, Google Glass, self-driving cars, or all the other fancy stuff they spend their time talking about. It’s because they dominate search and have more actionable user data for advertisers than anyone else on the planet. A core contributor to Google’s position is that they own and maintain a large portion of the internet’s infrastructure. It is entirely feasible that most of one’s internet-based activity moves through their pipes: Android, Chrome, email, news, search, maps, music, video, and apps. Google has made a very important and influential name for itself by giving away useful products for free. All the wonderful services Google provides (and they are wonderful) makes it easy to forget the fact that they are a large company that is concerned with making money and that most of that money is made through advertising. By giving so many of their products away for free, they are able to track internet usage and behaviours on those products, taking that information and feeding it back into their advertising network — their main money maker. Gmail, YouTube, Search, Android — they all feed into the Google database that, in turn, feeds their ability to make money through advertising in a virtuous circle. Fortunately for consumers, Google is a engineering behemoth and they take a very serious stance on privacy, security, and malicious ads. From a third-party ad serving perspective, they’re one of the best in the business (there’s a reason Facebook shut down LiveRail). Because Google is such a huge force in the industry, with an enormous user base, other companies want access to the users and identities that Google has associated with its services and devices. This desire is most prevalent in the ad tech space, where the vast majority of ad impressions move through the Google ecosystem. Trying to conduct business without working with Google greatly decreases both the amount and the quality of the business that is possible in online advertising. Google works with advertisers to provide creatives and buyers for ads, provides the exchange where publishers can sell their placements and impressions to the advertisers, and gives publishers an easy way to set up their sites to display ads from the Google ecosystem. 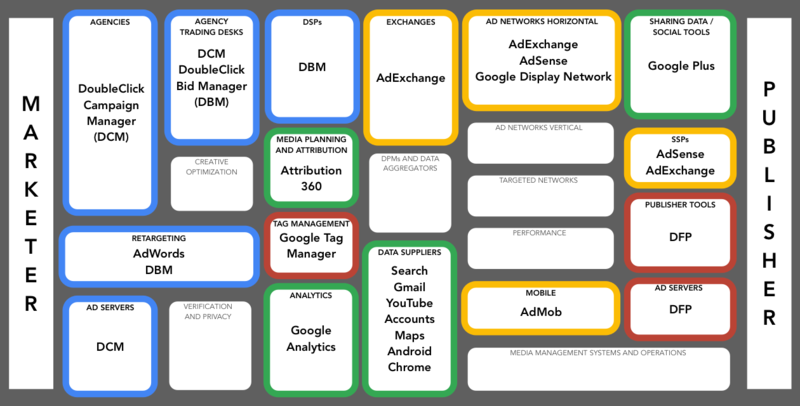 Google owns products in each of the main structural points of the ad tech system, and therefore isn’t dependent on any other companies for their business to function. If part of the ad tech space decides to fundamentally change things that would affect the way that Google conducts their business, Google has the ability and critical mass to effectively veto that decision or to adapt. Like all technology companies, Google is always at risk of being disrupted. It has bolstered its dominant position by actively acquiring companies that either complement or compete with Google’s homegrown products. Google acquires these companies in order to strengthen their position in the markets they occupy, or to fill gaps in their own offerings. They also get to come late to the game when they choose not to acquire - publisher and advertiser dependency on Google as a world-class provider of ad technology means they can release products after others have paved the way. Native advertising is a great example of a technology that Google does not currently prioritize, but where they will no doubt show themselves a significant force in the next year. Most of the time Google’s strategies are effective, but sometimes they miss trends. Facebook’s massive audience and unique first-party data pool has led to the first real challenger for internet ad dominance. Owning the whole stack has huge benefits for Google’s business. They are able to easily introduce rules to ensure that processes work in their favour. And, because they control these systems, they are also able to change the rules without much pushback or risk to their bottom line. For example, they are the first in line to fill the most lucrative impressions on a website, making the largest margins on those impressions in the process. Google gets to keep these advantages because they legitimately provide the strongest performance in the market, and that privileged position is self-supporting. Any company with only one or two of the businesses or products that Google has could be considered important and powerful in the tech space, but the fact that Google both owns and continuously improves across every significant aspect of ad technology means that they are singularly positioned to remain as one of the most powerful companies in the tech space. Google has recognized Sortable’s experience with both DoubleClick Ad Exchange and DoubleClick for Publishers and they consider us a trusted partner. You can learn more about this certification, or better yet sign up below and one of our publishing relations team will talk to you about how we can help you automate your ad operations.